What are we going to try to do differently? In none-agile environments retrospectives are sometimes done after a project is finished as a “post mortem” to derive “lessons learned”. Those tend to be long meetings. In constrast, in agile environments, a retrospective is short and done often (e.g. 90 minutes at the end of a 2-week sprint). Thus the project is still in progress and you can address issues jeopardizing the project’s success in time, hopefully keeping it on track. In Scrum, retrospectives belong to the cast of regular sprint meetings. In Kanban there’s a variety of ways to “schedule” retrospectives. In Lean A3’s can serve the same purpose. “The team” whoever that includes in your context. In Scrum it’s usually the whole Scrum team with dev team, PO and SM. If you have a specific topic that includes / affects people from outside the team invite them to work on a joint solution. What does a retrospective look like? agree on some actions (that will hopefully improve the situation). Clarify follow-up; Appreciations; Clear end; How could the retrospectives improve? You can support each phase with activities to spark ideas and interaction. Look at the Retr-O-Mat to see examples for such activities. Regardless of what we discover, we understand and truly believe that everyone did the best job they could, given what they knew at the time, their skills and abilities, the resources available, and the situation at hand. Concentrate on what you will do in the future. Just another meeting in which talk is cheap but no change follows – If the retrospectives don’t produce concrete actions or if no one carries them out afterwards, retrospectives are a waste of time. If you like the idea of retrospectives, Retromat can help you plan them and this 1-pager helps you teach others about retrospectives. Looking for ideas for your first retrospective? Try this plan. 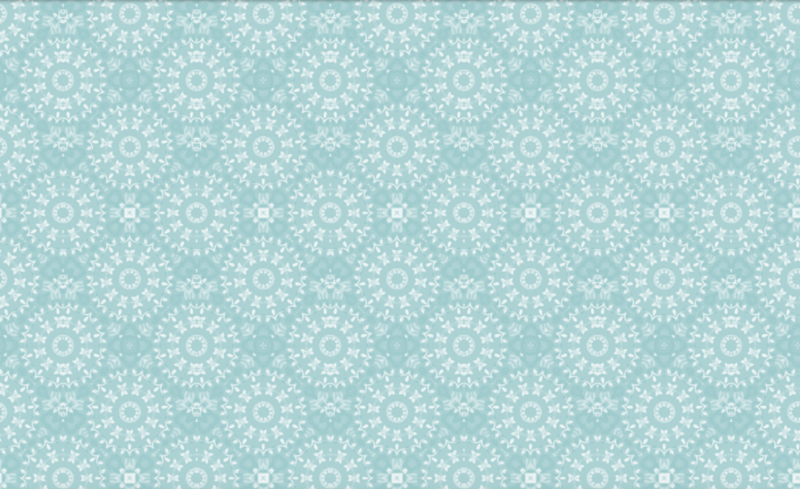 PS: Interested in retrospectives? Sign up to the Retromat newsletter to get related news and tips! 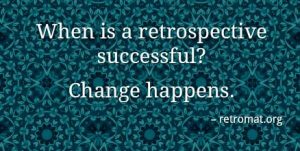 Why do you do retrospectives? When you first learn about retrospectives you might wonder why you would do them. In Scrum, they are even Scrum. But why? 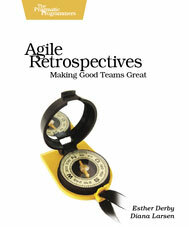 What is so great about agile retrospectives? What purpose do they serve? During the daily grind it’s incredibly hard to sit down and ponder your ways of working. Reserved time helps. If done well, the retrospective itself is a pretty powerful meeting. Sometimes the increased understanding between team members – knowing what makes the others ‘tick’ – is already a great leap forward and builds trust. Most of the time though, you will want to end with concrete action items i.e. experiments. Small things that the team will do to see if it helps with one of their problems. 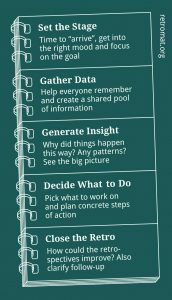 During any given retrospective you don’t know if an action item will be an improvement. You have to try it out. If it turns out to be an improvement you keep it and build on it. If it’s not, you stop doing it and try something else if the original problem still needs solving. And that’s why I think retrospectives are very valuable. Do the benefits sound good to you? If so, you might be interested in what a retrospective is now.